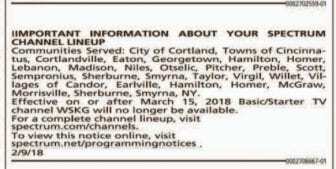 (Vestal, NY) Spectrum Cable has informed WSKG-TV that it plans to drop the public media TV station from its cable lineup in Tompkins and Cortland counties in the coming weeks. An exact date has not been determined. WSKG has a strong local presence in Ithaca and that will not change. WSKG has a strong radio presence in Ithaca with WSKG-FM, WSQX-FM, NPR, local news, a full time news reporter, a full time business sponsorship rep and a planned giving officer and that will not change. WSKG is engaged in a variety of Ithaca-based collaborations and that will not change. 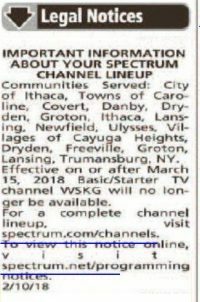 WSKG values its relationship with Spectrum Cable, but disagrees with this decision to take WSKG-TV off the cable systems in Tompkins and Cortland counties made only by Spectrum Cable, not WSKG. Spectrum might change its mind if members and viewers tell Spectrum that they want WSKG programming. Call Spectrum toll free, at 1-800- 892-4357 (one viewer reports “saying my choice was ‘Technical Support’ and then just repeating ‘Customer Rep’ finally got me to a human being and I was able to register my complaint to Spectrum”). 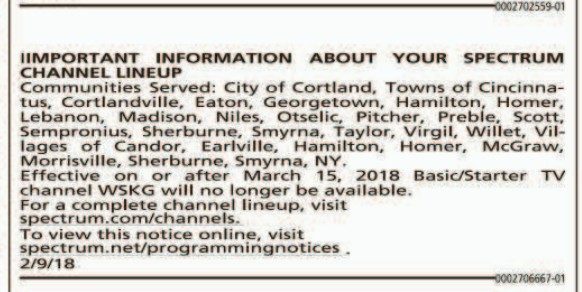 Tell them you want WSKG-TV to remain on your cable lineup in Tompkins and Cortland counties. Tell them not only do you want WSKG to remain on cable, but you want WSKG in HD, too! Also, call your elected officials and tell them to get involved.